February | 2018 | Home: Free Sociology! While putting together slides for my life course class I returned to BC Stats data on age-specific birth rates. It’s really nice data, broken down by local health area. I’ve played with data on the Total Fertility Rate before. This time I wanted to highlight a far simpler transformation in birth rates that I’ll call the Great Wait! What is the Great Wait? Basically, it’s the transformation in age-specific patterns of childbearing, whereby most women are having children later and later in the life course. 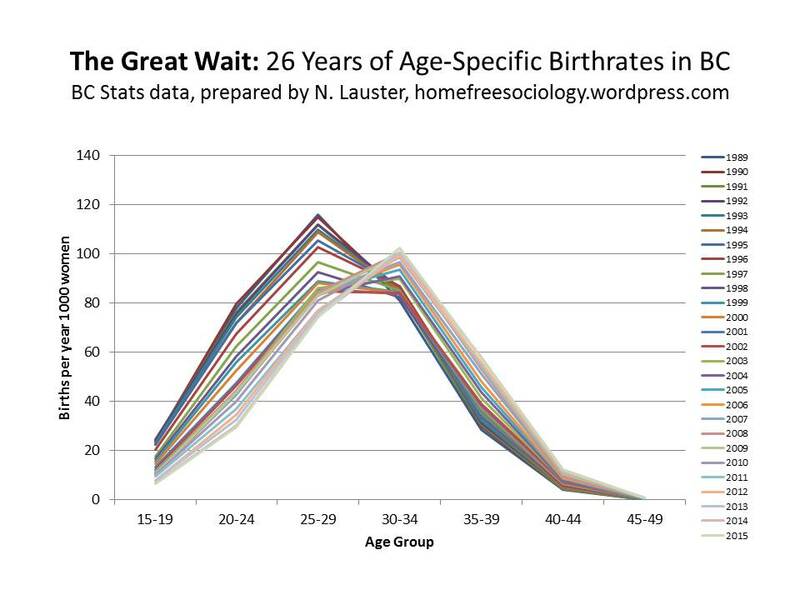 When I was playing around with the BC Stats data I accidentally produced a chart illustrating the Great Wait, and I just thought it was too beautiful not to share. Notice the gradual shift from peak childbearing in ages 25-29 (in 1989) to peak childbearing in ages 30-34 (in from 2003 onward). By 2005, more 35-39 year olds were having children than 20-24 year olds (so called “geriatric pregnancies” – which is like seriously a total FAIL in medical terminology). By 2010, the birth rates for 40-44 year olds began exceeding those of 15-19 year olds. We have fewer and fewer teen moms, and more and more new parents in their forties. There are many interesting causes and implications of this shift. On average women are taking longer to develop their education and careers before having children than ever before, facilitated by improved contraception and assisted reproduction technology. 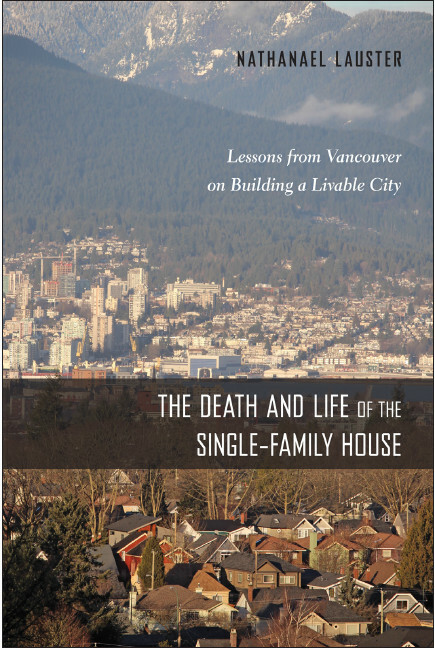 It may also be that women just don’t feel as ready to settle down into motherhood as they used to – either because the alternatives remain too interesting or because they don’t feel prepared for the job of being a parent yet (I’ve explored this latter explanation with respect to the role of acquiring housing as a stage prop for the role of parenthood here in my academic work). With respect to the implications, some of the childbearing delayed will inevitably be childbearing denied, as later-life pregnancies are biologically less certain for women, and some new risks are entailed. But on the whole, having children later means parents tend to be more committed and more prepared, with more resources at their disposal to help care for their children. Not a bad thing. On a technical note: the ongoing shifts in the timing of when women have children somewhat artificially inflate the magnitude of recent fertility declines. This is to suggest that 1.4 children (our estimate of the number of children women in BC have on average based on TFR measurement) is likely somewhat lower than the number of children the average of any given cohort of women will ultimately end up with. It’s kind of a demographer fixation.